When it comes to choosing the best spearfishing knives there are a few factors that you will need to take into consideration. How you will using the knife will determine which factors are most important to you and what you want from a knife. Take a look at the material, the size and the blade as well as how the knife attaches. Your knife needs to be in an easy to reach place, for whenever you need it. 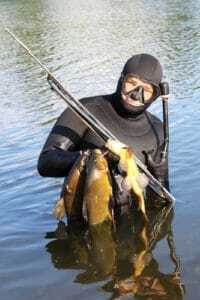 A dive knife or a spearfishing knife comes in handy for different types of situations. They come in handy if a diver becomes tangled in seaweed, fishing line or kelp. They are also used to dig or pry. Diving knives are also used on land to hammer things or to tighten or loosen screws as well as open clams. Those that spearfish will use their knife to cut and prep their prey. So what do you need to look for in a knife? The material of the knife is very important and you will usually find a dive knife for spearfishing in titanium or stainless steel. Both of these materials have their advantages and disadvantages. A titanium spearfishing knife is strong and also resistant to corrosion, however, the drawback is that they can be hard to sharpen. Knives made from stainless steel do require more maintenance, but they are easy to sharpen. Stainless steel knives come in 300 and 400 alloys. A knife with a 300 alloy is harder to sharpen but needs less maintenance. A 400 alloy knife is more prone to rust, but holds its edge well. The size of the knife that you choose will depend on what you want to use the knife for. 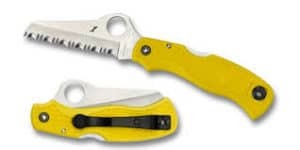 A recreational diver will only need a small knife with a 4” blade that can be used if you become tangled. If you are looking for a spearfishing knife or one for kelp diving or cutting fouled lines, then the size will depend on your situation. A blade can either be fixed or folded. A knife that has a fixed blade will come with a sheath for safety when not in use. The advantage with this type of blade is that you are able to take it out with just one hand. A knife that has a foldable blade is smaller and lighter. These blades will lock into position for safety. However, the drawback is that opening them with one hand can be tricky. In terms of the blade, you will need to look at the edge and the tip. The edge of the blade is either straight, serrated or a combination of both. A straight edge is ideal to cut nylon rope and plastics and a serrated edge is best to cut natural fibers and kelp. But it is a good idea to get a knife that features both so you are ready for any situation. The tip of the blade can be blunt or sharp, but there is also a tanto tip, which is between these two. A blunt tip is ideal for those that are digging, prying, chiseling and hacking. A sharp tip is a popular choice for spearfishing and can be used to cut and puncture. 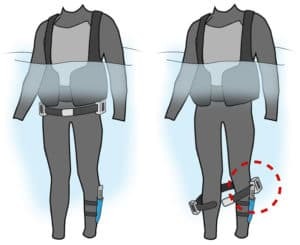 Usually a dive knife is attached on the lower leg opposite to the dominant hand, however, the problem with this is that it can become entangled with things underwater. 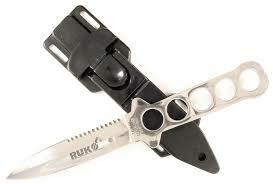 Many divers are now attaching their knife to their BCDs, because it is easier to reach. Here is a look at the best spearfishing knives for 2016. The best titanium spearfishing knife is the Promote Scuba Dive Snorkel Titanium Knife that features a medium blade of 4 3/8”. This knife is available in blunt or pointed tips and comes with an ankle sheath. The handle is comfortable and allows for an easy grip. The base is a hammer nub, which can come in handy if you need to hammer something in and many divers use this function on land making the knife multipurpose. This is a high quality diving knife that has a mid-range price bracket. 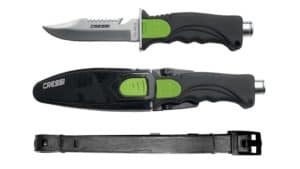 Users that have bought this knife have given it good reviews; on the whole, saying that the blade is solid, the sheath is well made and has a sharp main blade. The Cressi Skorpion Dive Knife is the best spearfishing knife for the money. 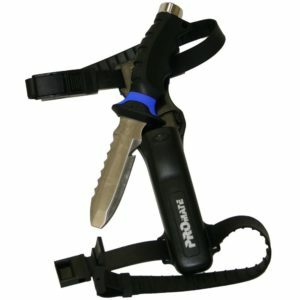 It’s a highly versatile knife that offers divers 3 major functions. The back edge of the knife is serrated, which is great for sawing and cutting harder materials. The line cutter allows the diver to safely cut through any line. The blade has a sharp front edge as well. The blade itself is made from a corrosion resistant stainless steel that is easy to sharpen. The knife is comfortable to use with its ergonomic handle. 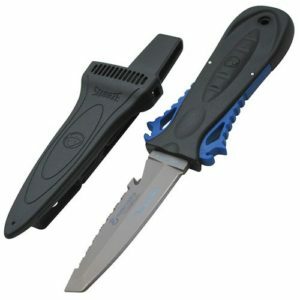 This is a popular freediving knife and scuba diving knife. This knife has received many positive reviews, with the main highlights being lightweight, nice hammer, good grip, great sheath, sharp and worth the price. Straight edge, serrated edge and line cutting notch. This mid-range spearfishing knife from Promate features a stainless steel blade, which is easy to sharpen, but remember that there is going to be some maintenance involved because stainless steel does have the tendency to rust. The blade is made from 420 stainless steel and the handle bottom features a stainless steel hammer. The sheath ensures that the knife is securely fastened and allows for a quick release. The knife does disassemble, which makes it easier to clean. Users highlight that the locking device holds the knife securely, is easy to release and that it is easy to disassemble for cleaning. If you are looking for a compact knife, then the Wenko Squeeze Lock knife is a great choice. It features a 3” blade, which isn’t huge, but it offers the best sheath mechanism. All you have to do is squeeze the handle on the colored tabs and your knife will be unsheathed. The blade is made from high grade titanium alloy. There is a tanto tip and alternative hollow ground serrated edge, making this a must have knife for a diver. Users have given this knife an overall good review saying that it is a small blade with a good sized handle. They also highlight that the locking mechanism is very secure, blade is solid and sharp and is lightweight. The Cressi Borg is another awesome spearfishing knife that has a 5.5” stainless steel blade with a drop point tip. The handle is covered in a non-slip rubber, which fits well in the hand. The Borg is able to chew through the line with a serrated back edge and long blade length. A small techno polymer thumb tab separates it from the blade. The sheath features a one hand release clasp. 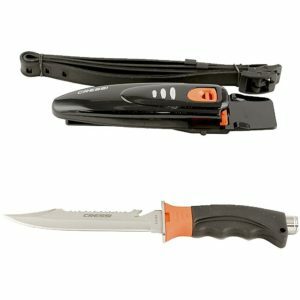 This is the best cheap spearfishing knife if you are a budget. 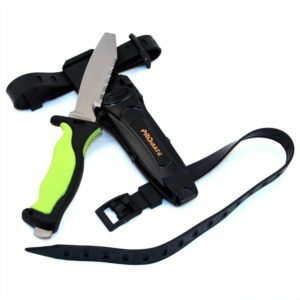 The knife can be attached to your leg with the two standard straps. This knife has gotten good reviews, with users saying that it is a balanced and sharp knife. Other highlights for users were the solid handle, release mechanism and easy to disassemble. 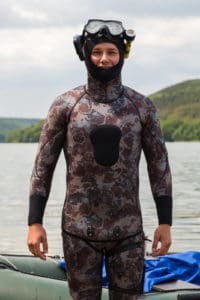 There is more to a spearfishing knife then you may have realized, so if you are looking for the best dive knife for spearfishing, then you should take a look at the ones that are outlined above. It is a good idea to compare dive knives, so that you are able to find the one that suits your needs perfectly. Compare reviews and find out what others think about the knives you are interested in. This will give you an overall feel for the spearfishing knife before you buy one. Remember that the knife, you decide to buy will depend on what you are planning to use the knife for. As a recreational diver, you may not need all the bells and whistles that some knives offer. As a spearfishing diver, you will need a tough knife that is able to stand up to every task that you set it.